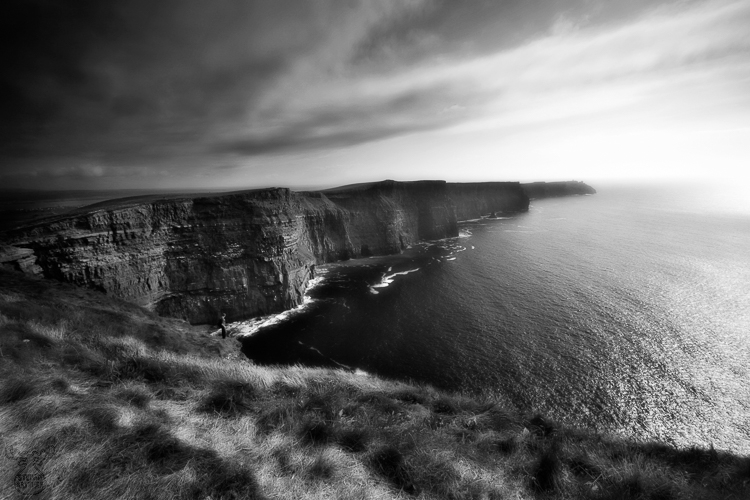 The Cliffs of Moher - one of "the" Irish sights you will find in any tourist or travel guide. No wonder you will have to fight for a place in the parking lot (with costs), and walking the way up to the coastline will be busy with lots of tourists and souvenir dealers. A dramatic shock after hours of silent driving through typical Irish landscapes. It's worth the while, no doubt (and the "stress"). The 214m high cliff panorama is gorgeous, and nothing to omit in a tourist's Ireland menu card. The Cliffs of Moher are actually around 8 km long, this view is the standard postcard motif from the viewing point at O'Briens Tower. I haven't taken the opportunity for walking some of the cliff path unfortunately. At this later point in time, you will still have some people and some with high risk of suicide, but it gets more pleasant. And it's easier to get risky yourself and climb that wall, in order get a better position for your own pictures from the tripod (or with other words, you find a place for setting up your tripod without people tripping over it all the time).